Kick off your visit on the 28th (Mon): wander the streets of Ciudad Universitaria, wander the streets of San Angel, and then take a stroll through La Condesa. 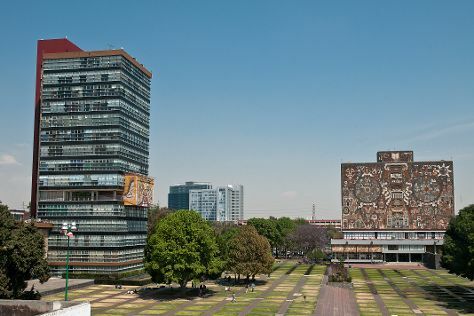 On your second day here, explore the world behind art at Museo de Arte Popular, then contemplate the long history of House of Tiles (Casa de los Azulejos), then enjoy breathtaking views from Torre Latino, and finally examine the collection at Museo Memoria y Tolerancia. To find more things to do, photos, reviews, and other tourist information, you can read our Mexico City trip planner. If you are flying in from Hong Kong, the closest major airports are Licenciado Benito Juarez International Airport, Querétaro Intercontinental Airport and General Francisco J. Mujica International Airport. In January, plan for daily highs up to 24°C, and evening lows to 7°C. Finish up your sightseeing early on the 29th (Tue) so you can travel back home.